Happy Tuesday everyone! The week ahead continues to look very active, with the first system moving in tonight. Temperatures tonight will be close to freezing when this system initially moves in; therefore some snow showers are possible. This won't last long, however, as we will quickly change over to rain. Areas from Louisville to Lexington could see around 1 inch of snow accumulation tonight before the changeover. •Tonight-Wednesday night: As I mentioned above, we have a shot at a few snow showers tonight before changing over to all rain. Heavy rain will be likely during this time frame with one to three inches of rain expected by Thursday morning. The National Weather Service has issued another flood watch due to the potential for more heavy rain and flooding issues. Always remember that a Flood Watch means that conditions are favorable for flooding, especially in flood-prone areas. If you live in a flood-prone area, make sure that you are monitoring the latest weather conditions and forecasts. 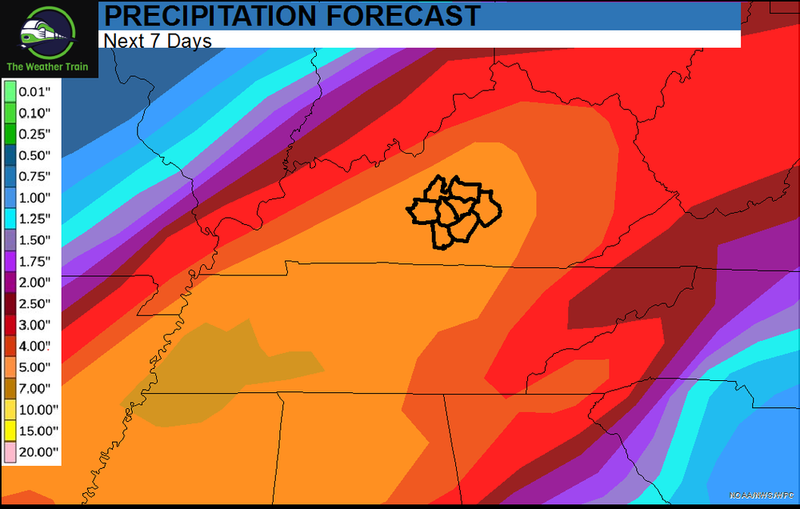 Flooding will remain an issue as more rain is expected by late week, with 4-6 inches of rainfall expected by Sunday. Rain isn't the only threat I’m watching, as the Storm Prediction Center has highlighted areas just to the west of our listening area for potential severe weather on Saturday. This is worth monitoring as a highlighted risk this far out is interesting. The main threats that are on the table as on now are damaging winds and isolated tornadoes.